Israeli Prime Minister Benjamin Netanyahu, center, sits next to Cabinet Secretary Tzachi Braverman, right, and Israeli Intelligence and Transportation Minister Israel Katz, at the start of the weekly Cabinet meeting in Jerusalem, Feb. 11, 2018. Israeli Prime Minister Benjamin Netanyahu said Sunday that his country had dealt "severe blows" to Iranian and Syrian forces inside Syria and would continue to combat any further aggression. "We made clear to everyone that our rules of engagement will not change in any way," Netanyahu said at the start of a cabinet meeting. "We will continue to harm anyone who tries to harm us. This was our policy and this will remain our policy." Saturday's raids came after Syrian air defenses shot down an Israeli F-16 fighter with anti-aircraft fire, the first time Israel has lost a warplane in battle since 1982. 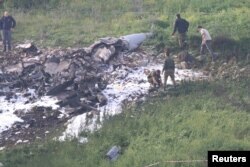 The Israeli pilots were able to eject from their aircraft, which crashed in Israel, according to the Israeli military. Israel said one of its pilots was "severely injured" in the "emergency evacuation," while another pilot was slightly injured. Israeli security forces walk next to the remains of an F-16 Israeli warplane near the Israeli village of Harduf, Israel, Feb. 10, 2018. Israel said it hit a dozen Iranian and Syrian targets in Syria, including command centers and missile defenses. Israel conducted the airstrikes after anti-aircraft fire downed an Israeli warplane returning from a raid on Iranian-backed positions in Syria. Earlier, Israel said it had shot down an Iranian drone launched from Syria after it entered Israeli territory late Friday. Several Israeli officials said they refused to accept an Iranian military presence in Syria, which Tehran denies exists. "From everything I know and everything I have read and what people on the ground have told me, Iran has thousands of military personnel in Syria. They've contributed enormously in a financial sense to the Syrian regime to keep it economically afloat," David Lesch, a Trinity University history professor and regional analyst, told VOA. "Of all the powers that have supported the Syrian regime, including Russia, I would say Iran is the one that has involved itself the most, has expended the most resources to keep Bashar al-Assad in power, and has the most to lose if he falls from power." The United States defended the Israeli response to the attack on its fighter jet. "Israel is a staunch ally of the United States, and we support its right to defend itself from the Iranian-backed Syrian and militia forces in southern Syria," the White House said in a statement. It urged "Iran and its allies to cease provocative actions and work toward regional peace." Syria says with the Israeli attack across its border, the rules of engagement have changed. Syrian legislator Ahmad Miri said the downing of the warplane creates a new situation in which Israel can no longer act with impunity in Syrian airspace. The Israeli airstrikes were the most significant since the Syrian civil war began seven years ago and have raised fears of an escalation and possibly war. Russia and the United Nations called on all sides to ease tensions. A spokesman for U.N. Secretary-General Antonio Guterres said that "all concerned in Syria and the region have a responsibility and must abide by international law and relevant Security Council resolutions." The secretary-general has also called for "all to work for an immediate and unconditional de-escalation of violence, and exercise restraint." Netanyahu said he spoke Saturday with Russian President Vladimir Putin. "I reiterated to him our obligation and right to defend ourselves against attacks from Syrian territory," Netanyahu said. "We agreed coordination between our armies would continue." Netanyahu also discussed the strike with U.S. Secretary of State Rex Tillerson. Syria's state media said earlier Saturday Syria is responding to "new Israeli aggression," following the Israeli raid. Feras Shehabi, a Syrian lawmaker, said Syria's response to Israel's assault signals a "major shift in the balance of power in favor of Syria and the axis of resistance." He said "Israelis must realize they no longer have superiority in the skies or on the ground." Israel Defense Forces spokesman Brig. Gen. Ronen Manelis said "Iran is dragging the region into a situation in which it doesn't know how it will end. We are prepared for a variety of incidents. Whoever is responsible for this incident is the one who will pay the price." The Syrian attack resulted in air raid sirens being activated in the Golan Heights and Beit She'an, but no casualties were reported. Robert Berger contributed to this report from Jerusalem.